You have two lungs, and they are located in your chest, behind your rib cage. Even though you have two lungs, they are not the same size - the lung on the left side is smaller than the right. Your ribs protect the lungs and heart in your chest, and the kidneys in the back. They connect to the backbone (or spinal column) in the back and to the sternum (or chest bone) in the front. Muscles that attach to the ribs can also help with breathing, if the muscles ordinarily responsible for breathing get tired. The diaphragm is a dome-shaped muscle that is just below the lungs. When the diaphragm squeezes, it causes your lungs to get larger, which makes air enter your lungs. When this muscle doesn't work right, you have a hard time breathing. There are many tubes that connect your mouth to the insides of your lungs. Your trachea (or wind pipe) is the big tube you can feel in your throat. This splits into main stem bronchi, which then split many more times into tiny tubes called bronchioles. 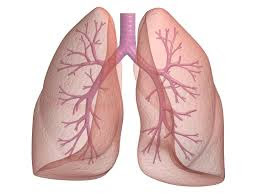 There are around 30,000 bronchioles in your lungs! At the end of each of these tiny tubes are little sacks called alveoli. These get bigger and smaller with each breath, and contain lots of blood vessels which is where oxygen enters the blood and waste (like carbon dioxide) leaves the blood. There are about 600 million alveoli in your lungs. If you stretched all of them out, they would be about the size of a tennis court! Special cells in your lungs produce mucous, which special little hairs in the tubes in your lungs move up and out. The mucous catches the dust, dirt, and bacteria that you breathe in constantly, and is your first line of defense against bacteria entering your body through the air. Your lungs are also very important for talking! Just above your trachea (wind pipe) is an area called the larynx, which is sometimes also called the voice box. This contains your vocal cords, two tiny ridges which open or close, allowing you to make low or high pitched sounds. The amount of air you force through them can change the pitch of the sound, and also changes the volume of the sound. Your brain is largely responsible for how fast you are breathing - it senses the amount of oxygen in the blood, and the amount of waste (carbon dioxide), and causes you to breathe faster or slower based on that information. This occurs whether you are sleeping, walking, or running a marathon. Keeping your lungs healthy is very smart, and many things can damage your lungs, including heavy pollution in cities, or tobacco smoke.